Growing up overseas fermented foods were a part of our regular diet. For the most part it was raw fermented sauerkraut, which we used in soups and salads. 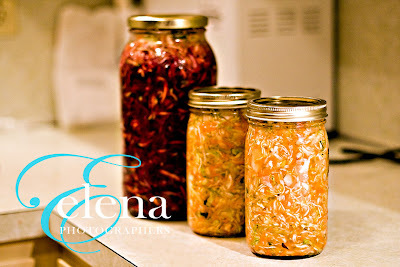 Back then, I do not think that we intentionally fermented cabbage with other veggies for the health benefits, but it was a fringe benefit for sure–we simply did it to preserve enough cabbage to last us through the winter and until the next season of fresh harvest. I remember the days when my Dad would work hard shredding cabbage for hours on a huge mandolin-like slicer, while Mom and we would grate carrots. In the end we would mix it all together, sometimes adding other ingredients, massage everything with salt, place in a huge vat, put heavy stones on top to help the juices come out, and leave it to ferment. We never had to buy sauerkraut from a store in a jar. Having moved to the US we slowly drifted away from our roots, since there is an abundance of fresh foods year around in this parts of the world. It was not until a few years back when I started to reintroduce fermented foods into our diet. I started by making kombucha at home, then I began to buy sauerkraut to add to salads, and then I was reminded just how simple fermenting veggies could be in the comfort of my own home, saving me a lot of money in the process. Fermenting veggies at home is super easy—anyone can do it! The only cost that is involved is what you pay for groceries and a little bit of your time. Almost any vegetables can be fermented. Organically grown vegetables are your best option: they are free from synthetic pesticides, herbicides and fertilizers and contain more lactic acid bacteria. Cabbage is the most ideal vegetable for fermentation, since it contains an abundance of lactic acid bacteria, as well as a good amount of vitamin C and some vitamin A. Onions and tomatoes are good complements for fermentation with other vegetables. Fermented onion is mild and relatively easily digested. Salt prevents both the overgrowth of yeast and the breakdown of vegetable proteins before enough lactic acid builds up to have a preservative effect. When making fermented vegetables, the salinity requirement is 1 to 1.5 tablespoons of salt per 2 pounds of vegetables. Saline water (1 tablespoon of salt per quart of water) should be added to cover the vegetables by at least an inch. A proper initial temperature is 68 to 72 F degrees for two to three days, which starts the fermentation. Then store the vegetables at 58 to 64 F degrees for four to six weeks. After this time, it’s good to store them at 40 to 60 degrees, which is adequate for keeping the vegetables for a year or more. Common spices for flavor include dill, mustard seed, juniper berries, caraway seeds, bay leaves, red pepper, coriander and many others. Raspberry leaves offer lactic acid bacteria as well as flavor. Sliced horseradish root is added for its preservative qualities as well as its flavor, and often this is layered on top of the vegetables. The best everyday containers to use for fermenting at home are glass jars with screw-on lids. The lids must be very lightly screwed down during initial fermentation. Individual jars may experience different rates of fermentation. Push down on the lids — if they are popped up and you feel any resistance, release the gas by loosening the lids. Be careful when attempting this technique and keep the jars covered with a towel to protect yourself. There are special crocks sold specifically for fermenting, if you wish to get more sophisticated and involved with the process. Veggies can be cut by hand or using a food processor or a mandolin slicer (I use V-shaped straight blade for cabbage, and smallest divided blade for other vegetables, although I did use a food processor for shredding carrots for my cabbage-and-carrot batch). Just imagine the possibilities with these beauties. 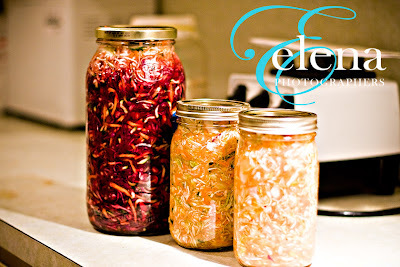 How to make RAW Fermented Vegetables from Elena Wilkins on Vimeo. I hope you enjoy making your own RAW fermented veggies as much as I enjoy making and eating mine. Once veggies are fermented, make sure to reduce salt content by adding it to soups and salads, without adding additional salt, or washing out some of the salty residue before eating them.